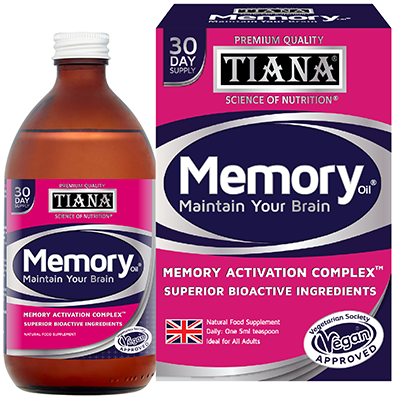 TIANA Memory Oil® maintains your brain functions including concentration, memory and learning. Contains only superior quality natural ingredients in liquid form and is more effective than capsules and tablets. Ideal for all adults, continued use provides the best results. Developed from extensive scientific research, containing Memory Activation Complex™ and natural bioactive ingredients. This high strength and high purity vegan formula in liquid form are created to benefit brain function. Vegan Omega-3 DHA stimulates the mind and protects the brain against oxidative damage that could have a negative effect on memory and cognition. It is important to consume enough Omega-3 DHA to fuel the brain. Turmeric with bioactive Turmerone and Curcumin are used in Memory Activation Complex™ which enhances energy for brain cells, maintains focus and concentration. In addition, a special group of fats known as Medium Chain Triglycerides or MCT are added to stimulate the production of ketones in the body. It is firmly established that brain energy metabolism fails a long time before any symptoms appear. Ketone Therapy has been successfully used in the treatment of Epilepsy for over 90 years. Kieran Clarke, PhD Professor of Physiological Biochemistry at the University of Oxford, England said: “Ketones are the most effective fuel you could have” – Ketones produce 28% more energy than glucose. “By providing alternative energy for the brain then you may be able to rescue the brain”. Brain cells have the highest priority for specific bioactive nutrients. Ultra-Co-enzyme Q10, a powerful antioxidant of high purity, superior quality and effectiveness with 98% CoQ10. Alfa-Lipoic Acid is a powerful antioxidant and premium quality, high strength and vegan Vitamin D3 (cholecalciferol). Studies show that low vitamin D levels are associated with cognitive impairment. Non-GMO, No fish, No additives, No preservatives, No artificial colours or flavours, No sulphites, No harmful impurities, No added sugar or sweeteners, No sodium, No soya or corn, No barley, No milk or lactose, No gluten or starch, No salt or yeast, No chemicals, Not tested on animals. Vegan. Food supplements must not be used as a substitute for a varied and balanced diet and a healthy lifestyle. If you are pregnant, breastfeeding, taking any medication or under medical supervision consult your doctor before use. TIANA Memory Oil® can be used alongside medication as it contains only natural bioactive ingredients and is free from drugs and hormones. The product has no known side-effects when taken directly. For specific advice on taking with medicines, we recommend that you contact your doctor. As a food supplement take one teaspoon daily with breakfast. Do not exceed recommended daily dose. No need to take additional Omega-3 DHA, Vitamin D and other ingredients listed. One 5ml teaspoon every morning with food. Shake well before use. Do not take on an empty stomach. Continued use provides the best results. Store tightly closed in a cool dry place. Once opened use within 60 days. Do not refrigerate.